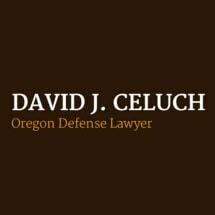 I am David J. Celuch, an experienced criminal defense lawyer based in Portland, Oregon. I'm known for giving practical advice and seeking creative solutions to difficult legal problems. At my law firm, you will find an attorney who can defend your rights against a wide range of criminal charges. I'm a committed advocate who can use appeals and post-conviction relief procedures effectively to challenge convictions and help you regain a sense of hope. If you have been charged with DUI, domestic violence, theft or some other offense, I stand ready to defend you aggressively. It is often possible to get charges reduced or dismissed. Even if you have been convicted, there may still be possibilities to minimize the consequences. Overturning a conviction isn't easy. But if you believe there were legal errors by the judge, your previous attorney or others, it is important to get an honest assessment of where you stand. This is especially true if you face a long prison sentence or possible deportation from the conviction. You can turn to me, David J. Celuch, for the help you need. I am a criminal defense attorney with more than 20 years of experience. And in my Portland law firm, I focus much of my practice on helping clients pursue post-conviction relief.